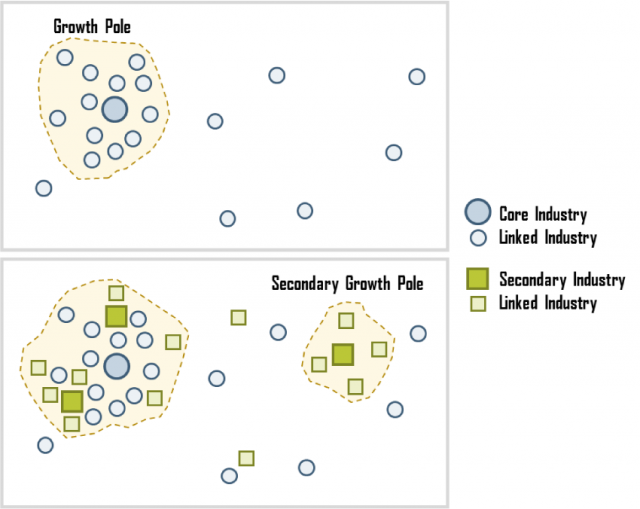 GROWTH POLE REFERS to the concentration of highly innovative and technically advanced industries that stimulate economic development in linked businesses and industries. This concept was first introduced by François Perroux in 1950, was further sharpened in following publications, and finally evolved into an idea that came to take on a meaning rather different from the one posited by Perroux. While he had conceived a growth pole to be a focus of economic development in an abstract economic space, it was interpreted by his disciples, particularly Jacques Boudeville, to be a focus of development in geographic space. Perroux, a 20th-century French economist, was largely influenced by the ecopolitical climate around him when he wrote about the concept of the growth pole. At this time, France was in its post-World War II phase of rebuilding itself under the Marshall Plan. Urban areas were the primary centers of economic growth, relying on technology- and innovation-based industries that thrived on primary resources such as iron ore or agricultural products from the surrounding region. These concentrations of industries often affected the economies of geographical areas outside their immediate regions. Also apparent to Perroux was the dominance of colonial centers over geographically dispersed colonized areas. Perroux’s observation and belief was that concentrations of economic forces would develop in areas that could provide the material and infrastructural resources necessary for the establishment, sustenance, and growth of key industries. These resources contributed toward the economic growth of this cluster of industries and caused them to become key or “propulsive” industries that caused an economic thrust in related industries and businesses through “fields of (economic) forces.” The thrust was not necessarily felt in the growth pole’s surrounding region, or even within its country of location. Therefore, this concept recognized the forces of polarization but did not recognize geographic or political boundaries. However, Jacques Boudeville and other interpreters of Perroux’s growth pole concept replaced “economic space” with geographic space, an idea that was readily adopted by regional planners and economic geographers who were pressed into making economic development plans on a regional scale. The idea was to identify selected nuclei for industrial growth to stimulate development in the surrounding area instead of focusing on the underdeveloped region as a whole. This idea was then touted as a remedy for jump-starting the slumping economies of entire regions or inducing development into economically retarded areas. As history has shown, this theory did not readily translate into practice when it was applied in the developing world, and growth could not be injected into a geographic region by adding a growth pole into it. A more comprehensive territorial approach seemed to be more appropriate for both rural and urban development. Even in the developed world, Dutch national planning experience aimed at correcting regional imbalances by earmarking less developed areas for growth during the 1950s and 1960s did not have the desired “spread effect” in the surrounding area. It has since been realized that the failure was not of Perroux’s growth pole theory but of its faulty application as a space-bound concept, and a remedy for all regional underdevelopment. Today, as economic interaction encompasses macroregions and becomes globalized, Perroux’s original theory seems likely to find validation. A recent example of such growth pole effects may be found in the Silicon Valley in San Jose, CALIFORNIA. The information technology (IT) industry here grew at a meteoric rate in the 1990s, but the economic stimulus was not restricted to the state of California or even the United States. Its impact was felt through increased employment and social development in the developing countries of Asia halfway around the globe.